Flood of support for Sean Abbot after death of Phillip Hughes. 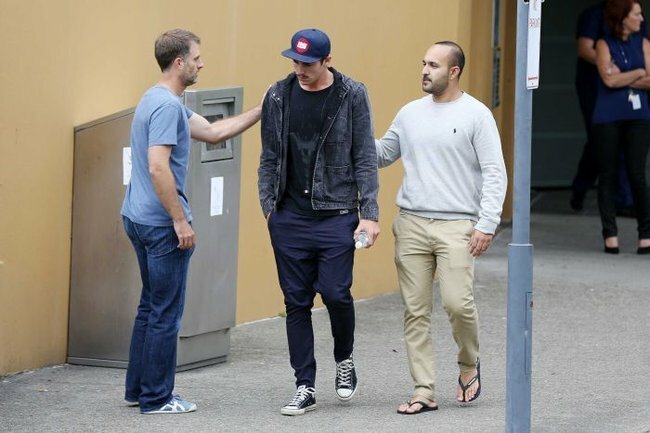 Sean Abbott receiving flood of support after death of Phillip Hughes. As the sporting world reeled from the news of Phillip Hughes’s death and tributes flowed for the young batsman, support began to pour in for the man who bowled the last delivery he would face. A day before the Sheffield Shield clash between South Australia and New South Wales began, New South Wales paceman Sean Abbott tweeted how excited he was to get back into long-form cricket. But that excitement quickly turned to horror when, in the middle of the 49th over of the first day, Abbott bowled a short delivery that felled Hughes and inflicted “an incredibly rare type of injury”. What Sean has gone through has been an incredibly traumatic experience … Sean is receiving all the possible support from Cricket NSW and Australia. A clearly devastated Abbott visited Hughes at St Vincent’s Hospital on the day before he died. “Obviously, what Sean has gone through has been an incredibly traumatic experience, as it has been for everyone who was present on the field that day,” Australian team doctor Peter Brukner said. “Sean is receiving all the possible support from Cricket NSW and Australia. “Sean came to the hospital yesterday. He’s been receiving a lot of support from Cricket NSW and his team-mates. “When he came to the hospital yesterday, Michael Clarke came down and spent a significant amount of time with him. Less than six weeks ago, the former Blues team-mates were celebrating a one-day international series victory in the United Arab Emirates after Abbott made his ODI debut in the first game. After the severity of Hughes’s condition became apparent, Cricket Australia (CA) announced the 22-year-old, and a number of other players around the country, were being offered counselling services. “It says a lot about Sean doesn’t it,” CA chief executive James Sutherland told Austereo on Wednesday. “Sean will have all the support he needs around him. “I’m sure his team-mates and everyone don’t feel in any way ill of him for what happened. Australian Cricketers’ Association (ACA) chief executive Alistair Nicholson said Abbott’s wellbeing was a primary concern. “He’s got a lot of support around from his team-mates and then also the counselling services,” Nicholson said on Wednesday. Since Hughes’s passing, people from around the world have been quick to tell the promising all-rounder to keep his chin up and assuring him he is not to blame for the horrific accident. This article was originally published on the ABC and is republished with full permission. Read more about the tragic death of Phillip Hughes here. Read and share a beautiful opinion piece about Phillip Hughes’ life and achievements here. Read about the tributes pouring in for Phillip Hughes here.